College is the best way for you to get what you want out of life. But why do people go to college? Does it really help you better achieve your goals and live a better life? Should everyone go to college? While going to college is a huge commitment of your time and energy, many studies have been conducted that show the benefits of seeking higher education far outweighs the costs. Check out 7 reasons why everyone should get higher education! Going to college today isn’t like what it was in the past. These days, courses are offered in a wide variety of fields. When you include the elective courses you can take, your options for learning everything from rocket science to 1990’s cartoons are limitless! While there are classes that seem silly to take, the opportunity to learn a variety of information on an array of topics can increase your social, personal, and employment prospects. For most people, going to college means learning that what you wanted to do…isn’t actually what you want to do. When we go to college we open ourselves up to more opportunities that we didn’t know we had – or even liked. Being able to spend your time actively pursuing what you think you want to do rather than dreaming and idealizing it is a fantastic way to build your confidence and find your true passion in life! As pointed out by Stephanie Owen and Isabel Sawhill in their research studies titled, “Should Everyone Go To College?”, going to college has a financial benefit that makes your time (and mental) sacrifices worth the commitment. According to their research, college graduates earn over $570,000 more in a lifetime with a four-year degree when compared to those that only achieved a high-school diploma. The financial benefits can be even greater for college graduates when you factor in the type of degree, the field of specialization, and the number of scholarships and grants you receive. Did you know that as of 2018, the unemployment rate for those with a college degree is 2.1% compared to the 4.2% it is for those with only a high school diploma? A college degree demonstrates to employers that you have dedicated the time and energy required to be a reliable employee who can meet deadlines, maintain an organized schedule, and deal with high-pressure situations. Is it your dream to travel the world and live in foreign places? If that is the case, going to college is an excellent way to achieve these dreams! The foreign job market, especially for native English speakers, is ripe for those with a college degree. Many people go on to teach English in other countries after college. Others, with more advanced degrees and additional foreign language skills, can go on to work for international corporations in some of the most exotic places in the world! Unlike high-school, college requires you to be solely responsible for maintaining your class schedule and completing coursework. Learning to manage your time effectively is an important step that makes life after college much easier. Though you can always ask us to write your coursework for you. Many books already validate the benefits of creating and maintaining solid routines early in life so that you can keep yourself on the right track towards educational and career success! If your goal is starting your own business, then college is definitely the right choice for you! Marketing, advertising, and business management courses give you the know-how and experience to successfully start, run, and maintain your business. Additionally, being skilled in creating solid business plans coupled with your degree can make you more eligible to receive loans from the bank to get your business up and running. 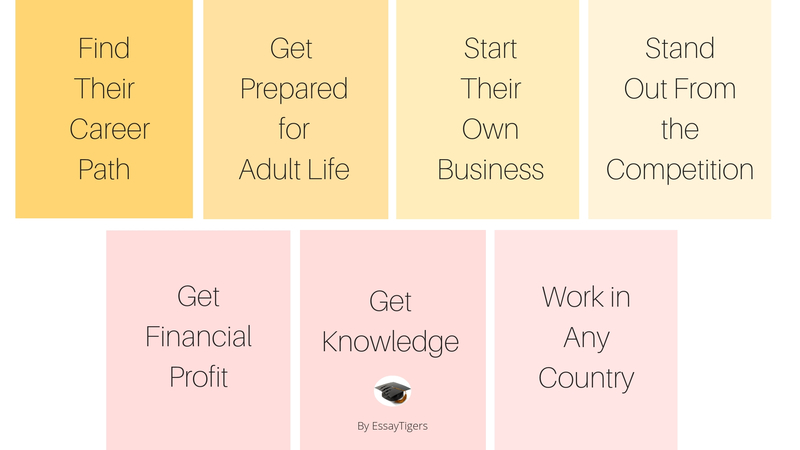 If you can’t create it by yourself you can always ask EssayTigers to write your business plan for you. Just because you don’t go to college doesn’t mean that you can’t reach your goals and aspirations. It only means that you will have to work just as hard to achieve them! By the way, we’ve recently completed the blog on what options you have if you don’t want to go to college. Making the choice to go to college is a sure-fire way to secure and elevate your financial, professional, and social future! If you are overwhelmed by the choices and decisions you need to make when preparing for attending college, check out the services that are specially designed to help. Give yourself the future you want and start the college application process today!